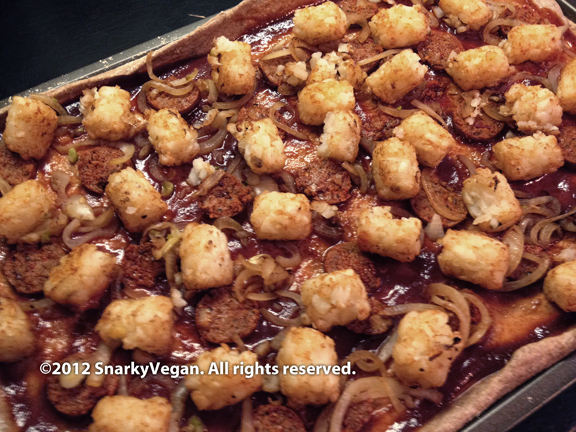 Snarky BBQ Tater Tot Pizza! This tater tot pizza is my contribution to the recent tater tot pizza craze that’s been sweeping Twitter of late. More on that later. Preheat oven and roast tots in oven until toasty. Use package instructions for temp and time. Set both aside. Raise temp in oven to 500F. Roll out the dough and place in a prepared pan (sprinkle pan with corn meal or rub on some oil to keep the dough from sticking). Slather on that BBQ sauce. You can see from the photos that I didn’t use much. In hindsight, I should’ve used twice as much sauce. Slice or crumble chipotle onto sauce. I might try the next one without any sausage as it kinda overpowered the BBQ sauce flavor. Sprinkle with onions and tots. Top with cheese. Pop the pizza in the oven, lower temp to 425F and bake 15-20 or until cheese melts and crust is browned. 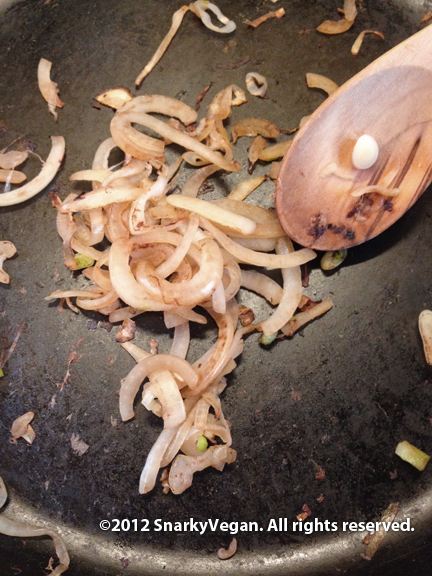 Dry sautéing onions is indeed possible in a non-stick pan. I used a seasoned cast iron skillet. A few bits get stuck as you can see but just keep it moving over high heat until you get crispy edges and the onions are translucent. Use twice as much BBQ sauce as you see here. 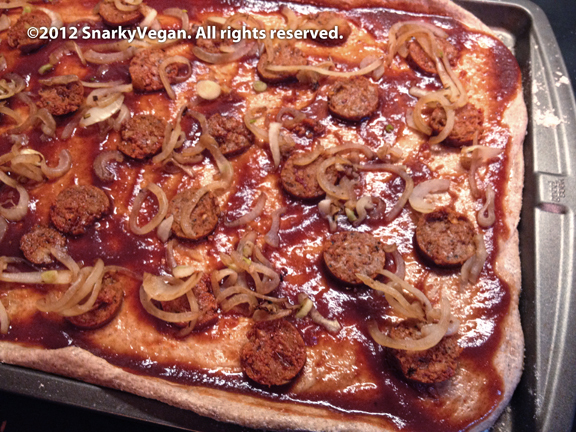 I was too cautious because I didn’t want the crust to get soggy as it easily can with too much regular pizza sauce. For some reason, BBQ sauce cooks differently. Add as much cheese as you want and bake. Ta Da! Now grab a beer! I am dying to find some sweet potato tots! I think they’d be lovely with the BBQ sauce. 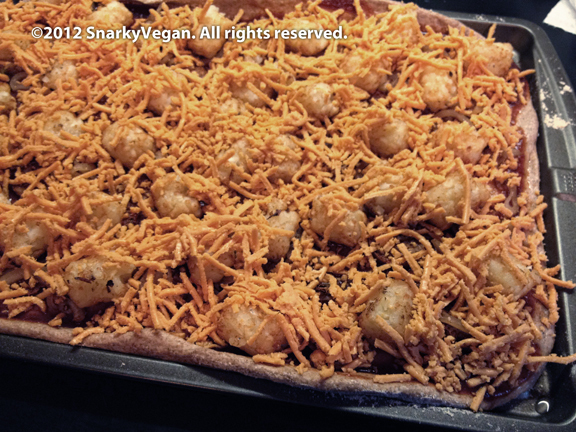 Pizza dough… tater tots… Daiya… Umm yah, count me in! 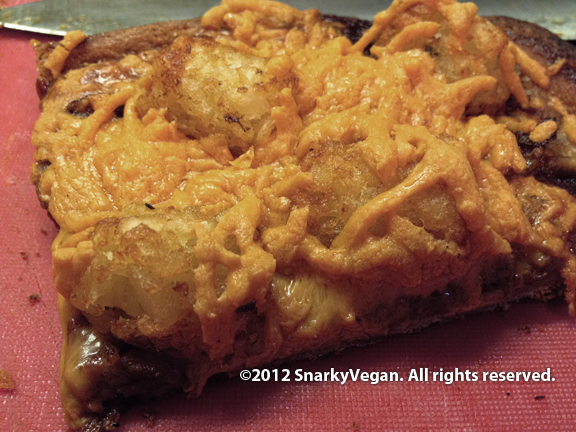 I’ve been drooling over all the tater-tot pizzas I’ve seen online lately, but have yet to jump in. I think I’m gonna have to now! What! That tastes so bloody fantastic! I love tater tots, but never on pizzas before! Clever topping, my friend!